Jar recipes and cookie in a jar mixes are a popular favorite when it comes to homemade food gifts. These Butterscotch Cookies in a Jar are taste-tested and tweaked to delicious perfection! You’ll find a free printable label on this page to help with your gift in a jar presentation. Layer ingredients in a one quart mason jar, in the order given. Screw the jar on the lid, and cover with a circle of fabric or a paper doily, held down with a rubber band. Cover the rubber band with yarn or ribbon and tie a bow. 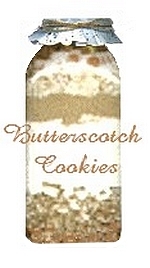 Print the Butterscotch Cookies Label and tie on as a gift tag, or glue to the front of the jar. Preheat oven to 350°F. In a large bowl, cream 1/2 cup butter or margarine. Add 1 egg and 3 to 4 tablespoons of water. Add entire jar of butterscotch cookie mix and stir until blended. Drop dough by spoonfuls onto an ungreased cookies sheet. Bake for 12 minutes in 350 degree F. oven.